Imagine a zoo without a giraffe! 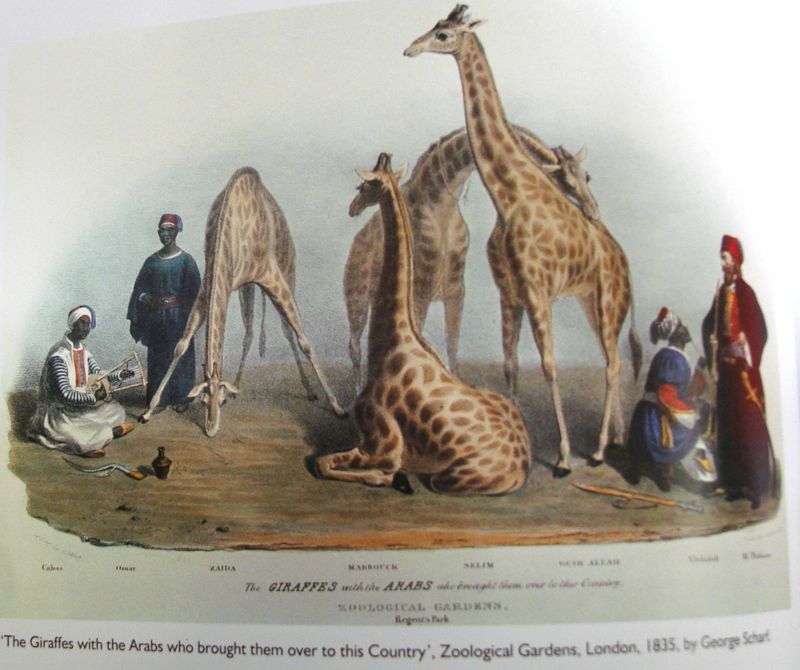 In 1827, George IV was given a giraffe (the first ever in Britain) by Mehemet Ali, the Viceroy of Egypt, for his menagerie at Windsor Park. The poor giraffe did not live long, as it died in 1829. 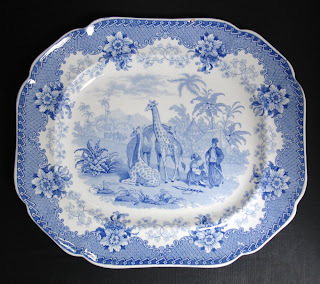 Had it lived, it would have been donated in 1830 by the new king, William IV, along with the other animals from the Royal Menagerie, to the London Zoological Gardens. (For information about the London Zoo, see my January 19 and January 21 posts). 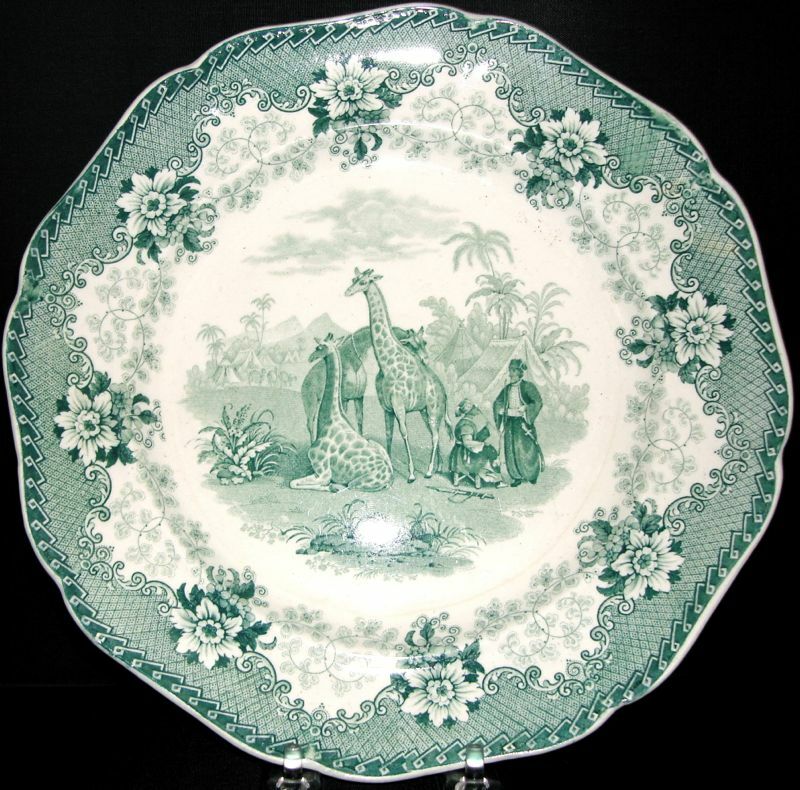 The Zoological Society commissioned a M. Thibaut to go in search of a giraffe. 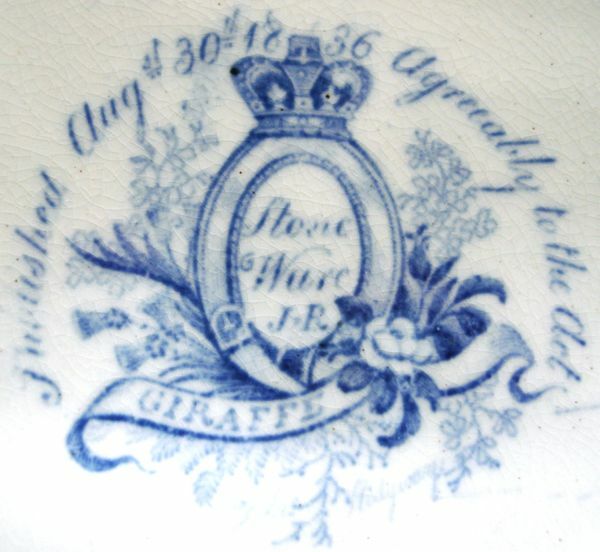 He captured eight giraffes, four of which died quickly from the cold, but the other four, three males and a female, reached England on May 25, 1836. 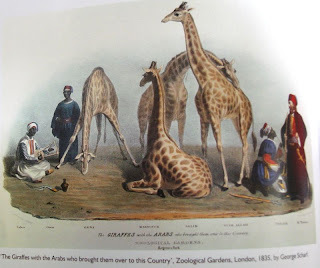 The giraffes were taken to the London Zoo, where they were met with a huge amount of enthusiasm by both the zoological community and the general public. 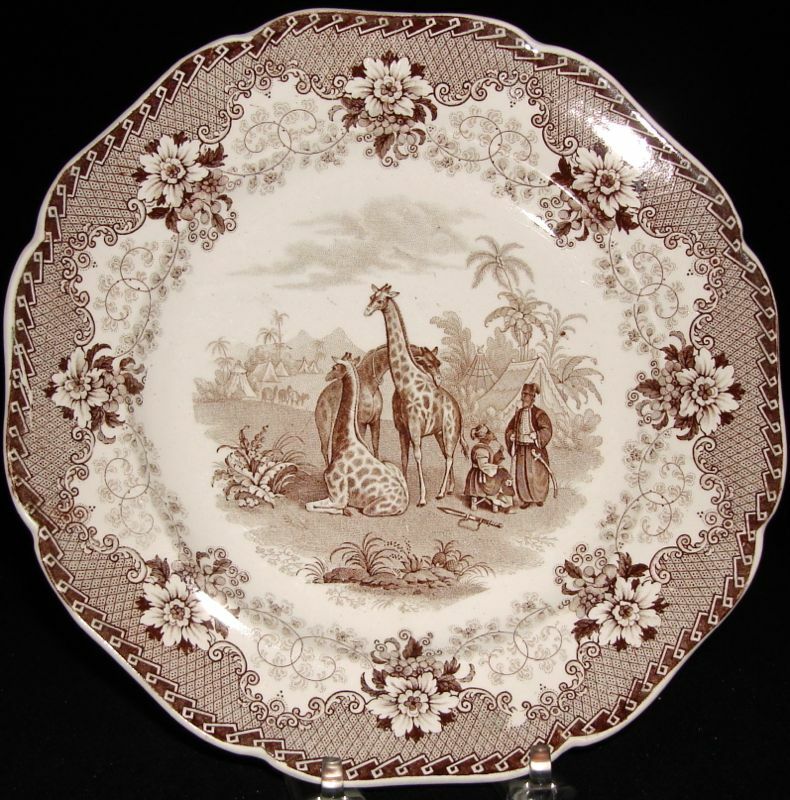 The Staffordshire potters, always quick to capitalize on what was popular, created patterns that celebrated the gentle and exotic giraffe. John Ridgway's (1830-1841) "Giraffe" pattern copied a print titled "The Giraffes with the Arabs who brought them over to this Country" by the engraver for the London Zoo, George Scharf. 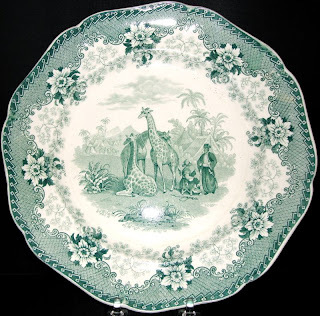 It shows the giraffe handlers plus the three male giraffes. 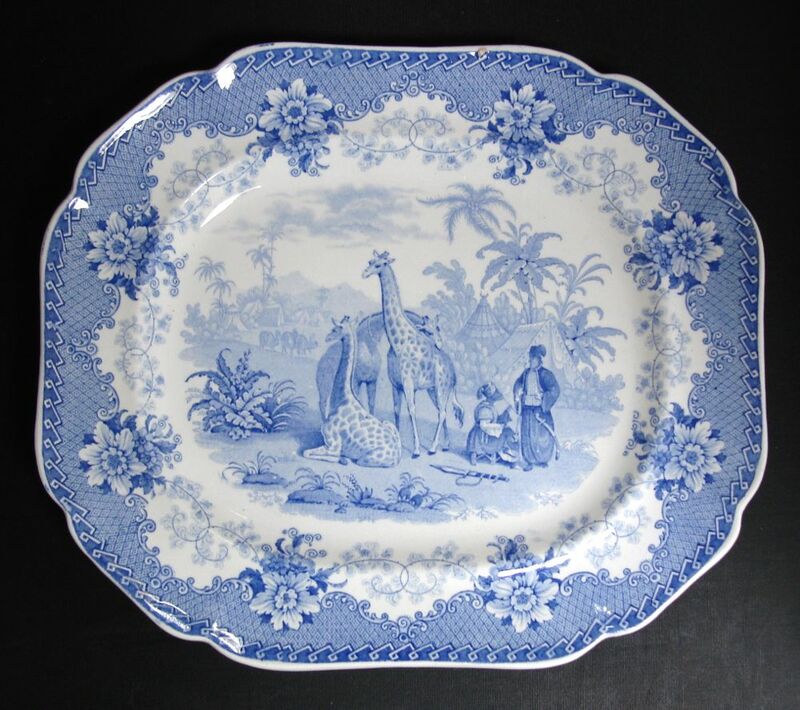 The female giraffe appears on the tea service, but that is a story for another day. All of the sizes and shapes in this pattern have the same center. I think it was printed in every color except yellow, although I personally haven't seen a black or pink printed example. However, I did own a cheese stand in gray. One can never say never when it comes to transferware. One of my favorite patterns! One of my favorite patterns too!